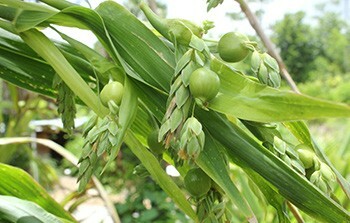 Job’s tears is a 1 to 2 m tall grass thought to originate from Southeast Asia. It is found throughout most of the tropics, often in wild stands along ditches and streams. 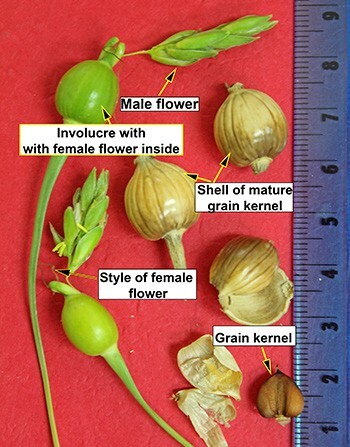 Depending on the variety, the seeds are yellow, purple or brown and are often tearshaped; hence, the name “Job’s tears.” There are both soft-shelled grain (var. ma-yuen) and hard-shelled ornamental bead (var. stenocarpa and var. monilifer) forms. Despite its minor crop status, Job’s tears merits consideration as a food plant for human and animal consumption. It produces 2-4 tonnes/ha of nutritious grain rich in calcium and containing more fat (5.5%) and protein (15.8%) than rice and wheat (LuFeng et al., 2008). The sweet-tasting raw kernel is eaten as a snack (van den Bergh 1996). In various parts of Asia, it is steamed like rice and included in soups, beverages and desserts. Dough from Job’s tears flour lacks gluten and, by itself, will not rise. For use in baking, therefore, Job’s tears flour should be mixed with flour of other grains (e.g., 70% wheat with 30% Job’s tears flour). Flour made from Job’s tears can replace maize flour in poultry feed (van den Bergh 1996). Animals can also be fed broken or whole grain. The green, vegetative plant material can be used as forage. Job’s tears produces about 13.9 tonnes of very palatable, green biomass per hectare (FAO). 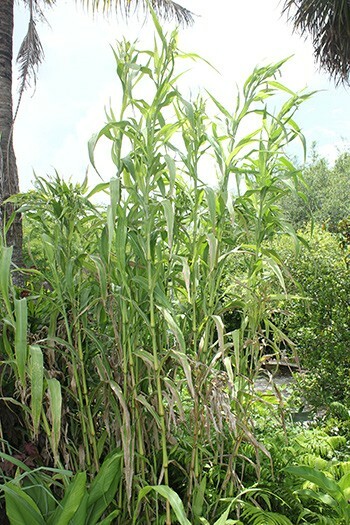 Job’s tears may be intercropped with maize or sorghum as a supplemental grain or as an alternative in case the main crop fails. Used in these ways, it enhances the resilience of farms in the warm, humid tropics. It has very few pests and diseases, requires minimal care, and can be productive on waterlogged, acidic and lateritic soils (Pandy and Roy 2011). In the tropics, it is found up to 2000 m. It is also reported to have various medicinal uses. Sow seeds (still in the shell) at thebeginning of the rainy season. Plant them 5 cm deep, roughly 30 cm apart within rows spaced 40-60 cm apart (FAO, van den Bergh and Iamsupasit, 1996). When sown as an intercrop, the spacing is typically more random. At 4-6 months after sowing, depending on the variety, the grain is ready for harvest and is threshed/husked with the same tools as are used for rice. Threshed grain is dried in the sun on mats. Stubble left in the field will tiller, producing fresh leaves that can be used as animal fodder. See Asia Notes 13 (in the Asia section of ECHOcommunity.org), and the references below, for more detailed information. ECHO’s seed bank can provide trial packets of a soft-shelled grain variety of Job’s tears called Mekong Mix to those registered with ECHOcommunity.org as active development workers (see the website for information on how to register). FAO. Coix lacryma-jobi L. Grassland Species Profiles. FAO/C IAT Collaboration on Tropical Forages.